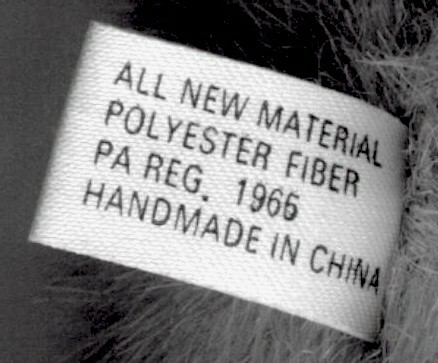 No comma after Ty Inc.
Back of tush tag reads "ALL NEW MATERIAL POLYESTER FIBER PA. REG. #1965 HANDMADE IN CHINA." Front of tush tag reads " � 1992 TY INC., OAKBROOK IL. U.S.A. ALL RIGHTS RESERVED." Tush tag shown is from a Nola first generation with a Hong Kong hang tag. Back of tush tag reads "ALL NEW MATERIAL POLYESTER FIBER/PVC PELLETS PA. REG. #1965 HANDMADE IN CHINA. 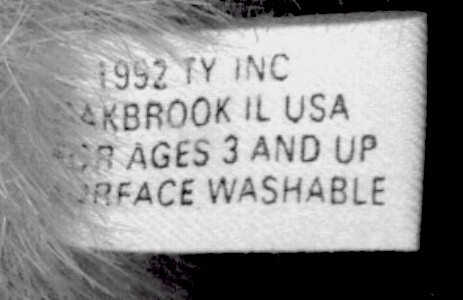 Front of tush tag reads "� 1992 TY INC DAKBROOK IL USA FOR AGES 3 AND UP SURFACE WASHABLE." Tush tag shown is from a straight back first generation Tyler with Korean hang tag. Note the "D" instead of "O" in "Oakbrook"
Back of tush tag reads "ALL NEW MATERIAL POLYESTER FIBER/PVC PELLETS PA REG. ' 1965 HANDMADE IN CHINA"
Front of tush tag reads "� 1992 TY INC OAKBROOK IL USA FOR AGES 3 AND UP SURFACE WASHABLE." Tush tag shown is from a third generation Cassie. Back of tush tag reads "ALL NEW MATERIAL POLYESTER FIBER/PVC PELLETS PA REG. 1965 HANDMADE IN CHINA"
Front of tush tag reads "� 1992 TY INC. OAKBROOK, IL USA FOR AGES 3 AND UP SURFACE WASHABLE." Tush tag shown is from a first generation Nola with head bow. Back of tush tag reads "ALL NEW MATERIAL POLYESTER FIBER/PVC PELLETS PA. REG. # 1965 HANDMADE IN CHINA"
Front of tush tag reads "�1992 TY INC DAKBROOK IL USA FOR AGES 3 AND UP SURFACE WASHABLE." Tush tag shown is from a first generation Whiskers, different ears, with Korean hang tag. Note the "D" instead of "O" in "Oakbrook"
Back of tush tag reads "ALL NEW MATERIAL POLYESTER FIBER PA REG. 1965 HANDMADE IN CHINA." 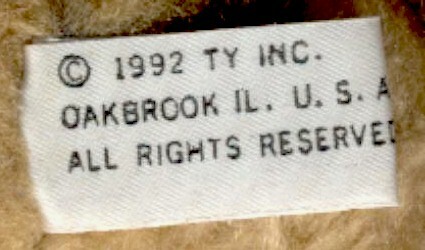 Front of tush tag reads "�1992 TY INC. DAKBROOK, IL USA FOR AGES 3 AND UP SURFACE WASHABLE." Tush tag shown is from a second generation Benjamin tag. Note the "D" instead of "O" in "Oakbrook" and a comma after Dakbrook. Back of tush tag reads "ALL NEW MATERIAL POLYESTER FIBER PA. REG. ' 1965 HANDMADE IN CHINA." Front of tush tag reads "�1992 TY INC OAKBROOK IL USA FOR AGES 3 AND UP SURFACE WASHABLE." Tush tag shown is from a third generation Abby. Front of tush tag reads "�1992 TY INC. OAKBROOK, IL USA FOR AGES 3 AND UP SURFACE WASHABLE." Tush tag shown is from a first generation Squeaky with clear whiskers. Front of tush tag reads "�1992 TY INC OAKBROOK IL USA FOR AGES 3 AND UP SURFACE WASHABLE." Tush tag shown is from a second generation Purrcy with "Beanie Babies Collection." 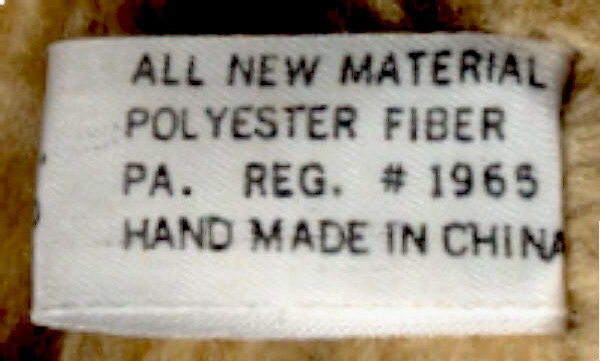 Back of tush tag reads "ALL NEW MATERIAL POLYESTER FIBER PA REG. 1965 HANDMADE IN CHINA." with large CE. Front of tush tag reads "�1992 TY INC OAKBROOK IL USA FOR AGES 3 AND UP SURFACE WASHABLE." Tush tag shown is from a second generation Cassie. Back of tush tag reads "ALL NEW MATERIAL POLYESTER FIBER/PVC Pellets PA REG. 1965 HANDMADE IN CHINA." with large CE.